This is a view from the veranda of the barracks in Nassau, on the island of New Providence (in the Bahamas). 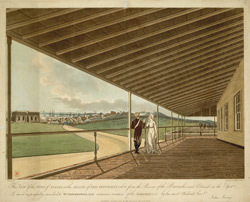 The barracks were spacious and well-ventilated, which helped to reduce the spread of diseases and the high mortality rate experienced in some of the more crowded barracks in the West Indies. The town of Nassau, the principal town and centre of government of the Bahamas, can be seen in the background of the picture.